The door is important because it reveals something about the conditions you experience while living in your home. If you wish to find out what your door presages, you need only to combine your birth star with the compass direction of your door. Remember, the compass direction is the direction you face when you stand in the doorway with your back to the inside of your home, facing out. Use the table of door and birth star combinations below and find your fortune as indicated by the number where the horizontal Door column and the vertical Star column meet. For example, if your door looks to the east, and your birth star number is 6, you would read paragraph 21 in the fortunes that follow. Although the prognostications are not engraved in stone, they do have relevant meanings. Read them only in their most positive and constructive sense. If you are cautioned or warned of difficulty for example, remember that you are always given the opportunity to find ways of overcoming possible hardship. And remember what Confucious said “The way out is through the door. Strange how so few people use this method.” You will notice that in this system 5 Star is not listed among the stars in the table. Males born under 5 Star should use 2 Star, females born under 5 Star should use 8 Star. For example, a male born under 5 Star whose door faces south should read paragraph 34, a female born under 5 Star whose door looks south should read paragraph 39. To find your birth star gents should subtract the sum of their birth year from 11 and ladies should add 4 in this sum. For example :- birth star of gents born on 05.06.1940 will be 11-(1+9+4+0)=11-5=6 whereas birthstar of ladies born on this date will be 4+5=9. FORTUNES OF YOUR PERSONAL DOOR 1. IMAGE: Walking at the edge of an icy precipice at midnight without a light. You will be confronted by all that you fear. Be on guard against serious entanglements, which will surely lead to emotional upset and loss of money. Confusion can occur and cloud your mind. Heedlessness to good counsel will needlessly expose you to danger. Take care and avoid bad moves. Develop vigilance. Wait until the dawn, wait until you clearly see the way. Then act. By following your desire you will develop wisdom. If you are a writer, you will be fortunate here. 2. IMAGE: an incongruous gathering of people where conflicts arise. Interference hinders progress. Scheming and quarreling lead to separations and losses. Issues about giving and receiving emotional and material support need to be sorted out. Remain true to your highest ideals. Be on guard against trickery. New ventures will run into complications. If you are circumspect avoid confiding in the wrong people, you will become successful. Be aware of what you want and what you are attracting. 3. IMAGE: a remote cabin in the woods. If you experience difficulties and setbacks, be patient, favorable changes will come about in due time. Your home favors leisure more than professional ambition. Financial prospects may not be the best, but you will have what you need to make ends meet. Be on guard against envy. Gossip will lead to trouble and disrepute. Contentment is your greatest wealth. 4. IMAGE: a traveler retreating from a hazardous pass in the mountains. You are blessed with divine protection. If you cultivate a humanitarian attitude and are willing to be of service to others, you will enjoy unobstructed growth, prosperity, and a good reputation. If, on the other hand, you are selfishly ambitious, you will come to a dangerous impasse. If you are running into more and more complications in your life, retreat and examine your motives. 5. IMAGE: water being poured from a golden vessel. Good fortune will flow to you as if from heaven. Success will come no matter what you do. It will be especially auspicious if you provide a needed service. You will benefit by creating opportunities for others. Seek the cooperation of friends. 6. IMAGE: a fresh stream of water flowing down from a lake into a valley. Your fortunes will flourish. It is wise to follow your desires conservatively. Be careful when making changes. It will be to your advantage to define and maintain your boundaries. Don’t bite off more than you can chew. 7. IMAGE: a waterfall cascading from the face of a towering rocky mountain into a rich green forest. Difficulties eventually give way to good fortune. There is much hope for you here. Be patient. If you hold out against untoward circumstances, you will come to enjoy great and lasting prosperity. Seek out ways to bring the diverging elements in your life into harmony. If you let others help you, your aims for prosperity and success will be realized. 8. IMAGE: a field, rich with corn, under the afternoon sun. Timely efforts bring rich rewards. Early stages of new ventures will be difficult, but after the midpoint, fortunes will flourish. Proceed calmly and carefully. Rely on experts for help and advice. You will overcome the challenges you face by focused attention and hard work. When your efforts are at maximum intensity, you will break through and your creative ideas will bear fruit. Great happiness will come to you and those you love. 9. IMAGE: a spring concealed in a mountain. A lonely place. If you are peaceful and content with simplicity and quietly develop your talents, your life will come to flourish. Be adaptable and patient. Obstinacy and impatience will only lead to failure. Your creative ideas and efforts will bear rich fruit in time. The goodness of your intentions will insure lasting success. 10. IMAGE: Inherited wealth. Good fortune and abundance will come to you if you cultivate a cooperative attitude. Be mindful of the relatedness of all life. The spirit of ancestors comes through to you very strongly here. They offer you the blessings of long life, prosperity, and many descendants. 11. IMAGE: a field lying fallow. You will experience difficult beginnings. Forcing your way will only lead to misfortune. If you call up your best powers of insight, however, you will find what you need to succeed. Don’t overlook the possibility that the difficulties you experience are actually caused by the way you view the world. If you discover your hidden talents and untapped resources, good fortune will follow. With the help of good people, you will become prosperous and even famous, and in the long run you will be able to share your good fortune with many others. 12. IMAGE: a wanderer lost in steep mountains and dense fog. If, in the face of difficulties, you give in to desperate struggling, you will only get lost. Rash actions will be the cause of much regret. Be aware of your mistakes and avoid becoming intolerant. Be courageous and let go off harmful thoughts. You will attract powerful friends and powerful enemies. Good fortune will be attained if you cultivate the patience to wait out difficult periods and if you are very discriminating and conscientious in your actions. 13. IMAGE: suspended animation. If you fall into the aimlessness this place suggests, there will be little or no progress in your career and your relationships will tend to stagnate. If on the other hand, you want to make progress, you will have to overcome inertia. Concentrate and persevere at your work. As activities increase, so will your responsibilities. Luck comes with discipline. 14. IMAGE: a mirror-like pond in wooded mountains. Cultivate balanced social relations and an easy manner and you will receive the help you need to become prosperous. Business and artistic activities will succeed if you enter them in partnership. If you are alone, you will find a companion. Marriage is favored. If, on the other hand, you decided to go it alone, your friendships will tend to come undone, progress will be slow, and money will be scarce. In the end, however, your fortunes will take a turn for the better. 15. IMAGE: a gold mine in a mountain. Being tranquil, like the mountain, you will be able to attain wealth, health, and happiness. Tranquility is the result of exercising inner stillness. Staying calm and centered, skillfully handling all that comes to you, will insure steady growth and progress. Like the earth that produces gold, your strong and constant efforts will result in lasting abundance for you and your loved ones. 16. IMAGE: the descending order of the generations- the grandmother, the mother and the daughter, the grandfather, the father and the son. Step by step you will attain all of your objectives. Be at peace with your lot. Cultivate your talents land do whatever needs to be done. Live simply and avoid being ostentatious, you will rise surely and steadily. You will become prosperous, life will go more and more smoothly, and all that you truly desire will be realized. 17. IMAGE: a sparkling river flowing in a luxuriant wood. Great good fortune and happiness await you in this place. If you are looking for a mate, you will be very lucky. If you are contemplating marriage; the outlook is excellent. If you follow the golden rule, you will come to occupy a central place and be an inspiration to others. Your creative efforts will meet with success and money will flow to you. The more selfless you become, the happier you will be. 18. IMAGE: the woods blossoming in the springtime. You will enjoy abundant growth and prosperity if you rely more on the help of those in higher positions than on your own efforts. Be careful not to boast, however, it betrays weakness and causes you trouble. Good fortune will come through new or renewed ventures and through ventures that start out small but have the potential of becoming large. You may receive a windfall. 19. IMAGE: thunder and wind. Everything will flourish. Help will come to you from those in high places and from unexpected sources. Be clear about your goals and wait for the right time to act. Whatever you truly want, you will attain. Prosperity, good health, and happiness will be yours. By all means strive for improvements in life, but don’t force it. Be on guard against trouble that comes up suddenly. If it does, stay calm and detached, it will pass. 20. IMAGE: a sunset in the late autumn. Strive to bring long-range plans and projects to completion. Put your roots down and grow. The grass is not greener on the other side. If you are doubtful and inconsistent, you will risk financial misfortune and marital troubles. If you persevere in bringing things to their natural fulfillment, you will enjoy great good fortune. If you hope to marry, the outlook is highly favorable. Be willing, however to make necessary sacrifices. 21. IMAGE: a falling star. In times of trouble, don’t overuse power. Be on guard against unforeseen dangers. Don’t take anything at face value. Appearances may be deceiving. Working out plans and making decisions under such elusive conditions spells trouble. Why shoot at a target that simply isn’t there? Better wait and cultivate your powers of observation. Everything changes. If you are patient, you will eventually be able to make unobstructed progress and attain your goals. 22. IMAGE: wood being chopped and thrown into a fire. First you will experience difficulties, but then success will come. In difficult times, ambitious plans will be impossible to achieve and you may suffer discredit. You may experience difficulties in marriage as well. Be on guard against infidelity in love. Avoid mistrust and restlessness. You will get nowhere using the wrong methods. Wait for the right moment to take positive action, you will have a breakthrough. Opportunities for prosperity and happiness in love will then abound. 23. IMAGE: a lotus-eater. How can you expect to live by daydreaming, which brings only mediocre financial prospects? You will be fortunate if you cultivate humility. Be flexible, temperate in judgment, and willing to be of service to others. Useful opportunities will then come to you. If you take advantage of them, you will prosper. 24. IMAGE: a thunderstorm. Take advantage of expert help. Heedless and aggressive pursuit of your aims may result in collapse. You are in danger of wasting much time, energy, and money. Cultivate self-restraint and powers of discrimination. Be flexible. The cause of your difficulties lies within yourself. By blaming others, you miss the opportunity for positive change. If you get expert help, you will be able to rise to a high place and become prosperous. 25. IMAGE: a ship in danger of running a ground. Don’t take your luck for granted. Conditions are changeable. It will be to your advantage to be adaptable. Keep a sharp lookout and be prepared to deal intelligently with obstacles. Know when to retreat and when to advance. You will arrive at your destination sooner by making allowances for delay than by forcing your way. If you work for the benefit of others, you will attract good fortune. Play your cards right and you will enjoy increasing prosperity, good health, and a good reputation. 26. IMAGE: a rich green valley. You will enjoy abundant growth and prosperity if you work hard to attain knowledge. Cultivate loyalty. Good fortune will come to you through new ventures and through ventures that start out small but have the potential to grow large. To realize your full potential, broaden your outlook, be faithful to your family and community, and promote the universal good. 27. IMAGE: a dragon appearing in a whirlwind. Everything flourishes. Help will come to you from unusual sources. You may gain through adverse circumstances, especially if you seek out opportunities to serve others. Whatever you truly want, you will attain. Be energetic and keep high ideals. You will advance to a high position, become prosperous, and enjoy good health and love. Be on guard against insincerity, however, for it will bring misfortune. 28. IMAGE: the wind rustling through the trees. It is unwise to be distrustful. Avoid becoming suspicious and meddlesome. Your affairs will flourish if you guard against tendencies to be indecisive and impractical. Help will come to you from people in high places. Protect yourself against useless hardships and concentrate on your personal development. Whatever you truly want, you will be able to attain. Anxious questioning is a waste of time. 29. IMAGE: a bodhisattva, a practitioner of selfless compassion. Many obstacles will come your way. You will be challenged again and again to search yourself and to tap your deepest resources and latent talents. Don’t give in to tendencies to isolate yourself and become despondent. Follow your intuition. Help comes unexpectedly. Trust your innate sense of right and wrong. You will come to no harm. As you conquer your obstructions, you will become able to be of real help to others. 30. IMAGE: a castle falling to ruin. Humility and selfless devotion are auspicious. If you take responsibility for the trust others place in you, you will advance in life. On the other hand, insincerity and irresponsibility will cause you to undermine your career and personal relationships. Aggressive pursuit of selfish aims in troubled times will only compound trouble. Cultivate right conduct and honesty. Everything changes in time. If you exercise patience, your fortunes will improve. 31. IMAGE: a mountain covered with trees that are all in flames. Inconsideration and reckless action lead to rifts. You will meet with professional opposition as well as troubles at home. Be on guard against tendencies to be indifferent towards loved ones. Keep faith during trying times and learn from your mistakes. Be vigilant. Timely action will result in good fortune. Take advantage of unexpected opportunities. You may receive help from someone in a high place. The door to whatever path you wish to take will open. 32. IMAGE: a woman tending a fire. For you, life at home is more pleasant than the ups and downs of life out in the world in pursuit of fame and fortune. Be receptive and attentive. You will be very fortunate if you enjoy helping others. If you work creatively at home, you will prosper. Home is especially conducive to love, good health, and a happy family life. 33. IMAGE: a pioneer. Complications rooted in past mistakes may force you to start anew. Don’t overestimate your knowledge and skills. There is much to learn. Follow the example of others who have more expertise than you, and the way to prosperity, happiness, and good health will open. Be patient when under pressure. Hold to that which nourishes your spirit. 34. IMAGE; the sun setting over a scorched desert. Venturing forth under adverse conditions will bring you nothing but loss. It is better to wait for conditions to change. Take advantage of periods of waiting by broadening your mental horizons. Carefully examine the inner causes of your difficulties and guard against blaming others. In due time you will be able to take creative action. The way will open and you will prosper. 35. IMAGE: the myriad life forms that are embodied in the earth. Abundant opportunities for progress and prosperity come to your door. You are blessed by heaven with unobstructed creativity. You have luck and are able to turn negative conditions into positive ones, not only for yourself, but for others as well. Helping others draws down the blessings of heaven. If you follow the golden rule, you will be highly respected. 36. IMAGE: a brilliant star. What you believe in your heart will come true. Cultivate positive faith, concentrate your efforts, and you will succeed in realizing every one of your aims. Abundant opportunities lie before you. Good health, professional success, and a good reputation comes to your door. With patience and intelligent planning you will be able to build a fortune that will provide comfort and security not only to you and your loved ones, but to future generations as well. 37. IMAGE: an initiation ceremony, a transmission of light. It will be a challenge to be receptive and humble. If you hold an egoistic attitude and insist upon being the leader, not only will you miss the point but you will be depleted. Be open in order to receive creative inspiration. Let yourself join forces with others. Be cooperative and flexible. You will be respected for your talents. 38. IMAGE: a recluse. When roads are closed, it is better to return to old conditions and wait. Be on guard against the lure of unrealistic schemes. Take advantage of periods of inactivity by gaining more knowledge. The greater your knowledge, the greater your chances for ultimate success. You will be helped by your superiors. If you are alone, you will meet someone in whom you will be able to place your trust. Good fortune will come through a companion. 39. IMAGE: a sunset over the mountains. The past looks better than the future in some important respects. The future seems to have limited prospects. You may be neglecting an important aspect of your life. Cultivate insight and examine your needs. It is useless to dwell on the past and blame others for your troubles. Observe decorum and generosity of spirit or you will suffer losses. Cultivate seriousness of purpose. You will be successful in occupations that involve research and investigation. 40 IMAGE: water rising the boiling point. Advance, don’t retreat. Strive to know your true aim and seize your opportunities as they show up. Be on guard against becoming distracted, and don’t be afraid to take corrective measures when necessary. Conditions may change swiftly. You will need to be alert and ready to make quick and expedient decisions. Keep your goal clearly before you and you will have surprising success. 41 IMAGE: a spearhead. Persevere in going forward. To avoid danger is worse in the long run than exposure. If you lack courage and leadership skills, you will suffer losses. You will be confronted by much uncertainty, doubt, and frustration. If you turn tail and run away, however, you will meet with disaster. You have no choice but to press forward and cultivate new skills as you go along. Be resolute. 42. IMAGE: a gold mine deep in a valley. You will be more fortunate by following than leading. Be responsive to others and you will live a full and satisfying life. Stay calm and centered, skillfully manage your affairs, and steady progress and growth is assured. Like the earth that produces gold, your strong and constant efforts will result in lasting abundance for you and those whom you love. 43. IMAGE: a farmer laboring under adverse conditions in springtime. Do not succumb to doubts or let early failures discourage you. Strive patiently to overcome obstacles. Weakness will be followed by strength. If you are adaptable and hard working, you will attract the help of people in high places. Creative projects will ultimately bear rich fruit. 44. IMAGE: breaking ground and striking gold. Hardships are followed by gains. Be adaptable. Persevere and you will overcome obstacles. If you display courage and positive determination, you will attract the support of superiors and will eventually attain a high position. You will strike gold through creative activities. 45. IMAGE: a mirror. To go forward is to go back. If you find conditions in the world unsatisfactory, recognize the deficiency in yourself. Return to the peace and security of your home and cultivate your talents. If you persevere, you will ultimately become successful. You will receive needed help from friendly people. Creative freelance work is most favorable. Later years will be easy. 46. IMAGE: people playing tug of war. Creating is confused with destroying. Guard against acting at cross-purposes with yourself. Don’t waste your time minding other people’s business. Be aware of what you are creating. If you are discerning, you will discover many interesting opportunities for your own advancement and prosperity, and for creating peaceful conditions at home. 47. IMAGE: blessings coming down from honored ancestors. You will attract good fortune by adopting a modest attitude. Cultivate friendly relations with neighbors. Be mindful of the relatedness of all life. The spirits of ancestors come through very powerfully for you here. They offer you their blessings of long life, prosperity, and many descendants. Everything points toward success. 48. IMAGE: rearing a child. You need patience. Success depends on biding your time and acting at the right moment. Be kind to yourself. Rest and cultivate good health. You will be prosperous and fortunate in your marriage and raising your children. 49. IMAGE: a mirage. Examine possible discrepancies between what you imagine and what actually exists. Gains may be ephemeral. Be circumspect. What appear to be opportunities may actually lead to reversals. Take advantage of inactive periods by attaining new knowledge. Be very discriminating, persevere in what you know to be right, and you will be successful. 50. IMAGE: a ruby flashing in the sunlight. Fame comes with successful works. Let your intuition guide your decisions about possible courses of action. Specialize in your field of endeavor and prosperity and renown will be yours. Take advantage of the help of juniors or people under you, but show care and consideration for them. Your good fortune will be long-lasting. 51. IMAGE: navigating a ship by the stars. You will be successful by following your true aim or potential. If you’re not aware of your true course in life, spend time exploring various routes until you discover it. Once found, devote your full attention to its fulfillment. Seeking new knowledge will always be of great benefit to you. Your success depends on self-cultivation. Know what you need. Be cautious and discriminating. Don’t waste time with the wrong people. 52. IMAGE: an underground lake What you seek will be out of reach unless obstacles are removed. There will be very few to help you and you will have trouble finding companionship. Your growth will be limited unless you tap your own resources. Seek to discover your inner strengths and talents. Once you achieve self-knowledge, think and act independently, and use your talents for the benefit of others, you will be prosperous, well-known, and fortunate in love. 53. IMAGE: the chopping down of a forest. Curbing evil brings rich rewards. The beginning may be lucky, but incompetence and extreme actions will threaten ruin. Follow the middle way. Strengthen your spirit and sense of purpose, and analyze your situation before deciding on the best course of action. Be careful about whom you employ. Preserve early gains, be moderate, and rely on expert advice. 54. IMAGE: an island in a garden pond. Worldly pleasures will be yours. What you desire, you will get. Take advantage of your opportunities. You will be helped by someone in a high place as well as by your peers. Your fortunes will flourish. Beware of vanity, however. 55. IMAGE: a mountain lake reflecting the heavens. Whose ideas are you following? Slavishly following the rules of others is unfortunate. If you cultivate independence, you will attain your creative possibilities are endless. Tireless effort will bring about great productivity, wealth, good fortune in love, and a healthy and happy family. 56. IMAGE: gold being refined by fire. Though hardships have to be endured, they are followed by flourishing fortunes. Work hard to clearly define your aims. Develop managerial skills in both professional and personal affairs. Change brings promotion, resulting in a secure position. Before you set out to reform others, however, work to refine yourself. 57. IMAGE: the sun shining at midnight. If you are timorous and self-centered, you will be used by others and will have to work hard for small gains. Abandon selfishness and expand your life. You will discover where you are genuinely useful if you cultivate inner light and follow your intuition. Be gentle and promote peace and harmony. Success will come through cooperation. Accept divine guidance. 58. IMAGE: the gulf between heaven and earth. Do not attempt to achieve something beyond your abilities or qualifications. Work at improving your skills if you don’t want to be held black. Serious lessons in life may have to be learnt in order to overcome misfortunes. Follow your heart. Once you develop the skills you need and are able to fully release your creative energies, you will become very successful. A great opportunity may come from a lowly source. 59. IMAGE: buried treasure. What you seek will be out of your reach unless obstacles are removed. Discover your inner strengths and talents or your growth will be limited, you will have trouble finding companionship, and there will be few to help you. Your sincerity will be challenged. Be circumspect to avoid troubles. If you cultivate your inner virtue, do what is just, and are willing to help others, good fortune will follow. 60. IMAGE: a trespasser. Be careful to keep disintegrative conditions from entering your life. Be on guard against saboteurs and do not entertain relations with destructive people. Be patient in the face of restrictions. You will invite great losses if you violate the boundaries of others. It is better to wait for positive signs. Help will come from high minded persons. You will be fortunate if you bear a child. 61. IMAGE: a pot of gold. Your fortunes will flourish. Beware of becoming overly ambitious, however, or you will fall. Nothing and no one is entirely independent. Be humble and considerate of others and you will avoid pitfalls. Many opportunities for success will come your way. You will be helped by someone in a high place. 62. IMAGE: a cloudless autumn sky. Patiently bring things through to completion and you will reap a good harvest. Be gentle, relentless striving will meet with misfortune. Temper your ambition and strive to grow inwardly. Though success is yours, you must be humble. Be vigilant. Wait for the right time to advance. 63. IMAGE: paradise. You will attain whatever you wish for. The greater your effort, the greater your gain. Be firm of purpose. Cooperate with those above and below you. Success and prosperity will come to you through creative work, especially, through writing. Spiritual work will progress unobstructedly. 64. IMAGE: a fox. Be careful that you aren’t secretly on the defensive while seeking to join forces with others. Mistrusting others will cause them to mistrust you. Your insincerity will alienate others. Seek to balance your heart and mind. Blind passion will result in entanglement and losses. Clarify your aims. Vacillating and worrying accomplish nothing. Stay centered and you will become secure and prosperous. In this way we can understand that the impact of fengshui varies from person to person residing in the same house. 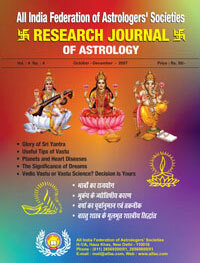 In this Astrology, Mundane and Vastu Issue of Research Journal of astrology there are various informative and research oriented articles related to prediction technique like - Facts about Gems, The Roots of Indian Astrology, Nakshatra 2008, Glory of Sriyantra, Alternate or Special Lagnas, Planets and Heart Diseases, Vedic vastu and vastu Science, Effect of Saturn's Transit in Leo, Nakshatras and Navamsha, Saturn : the Potential force, The Significance of Dreams, Introduction to Medical astrology, Astrology and Mental Health, Vastu tips, The Fortune of Your Personnel door, Vastu Shastra for Prosperity in Life, Rajyoga of 8th House, Predictions about Rains and Earthqukes, The Relation of 5th, 9th and 12th house with Dasha of Birth, Herbs, Fundamentals of vastu.